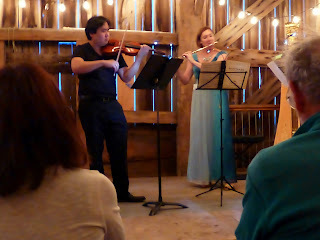 Last Saturday, my friend Lisa and I went to a concert in a barn which turned out to be a truly magical experience. This was held at By Chadsey's Cairns Winery, Prince Edward County, by the shores of Lake Ontario. 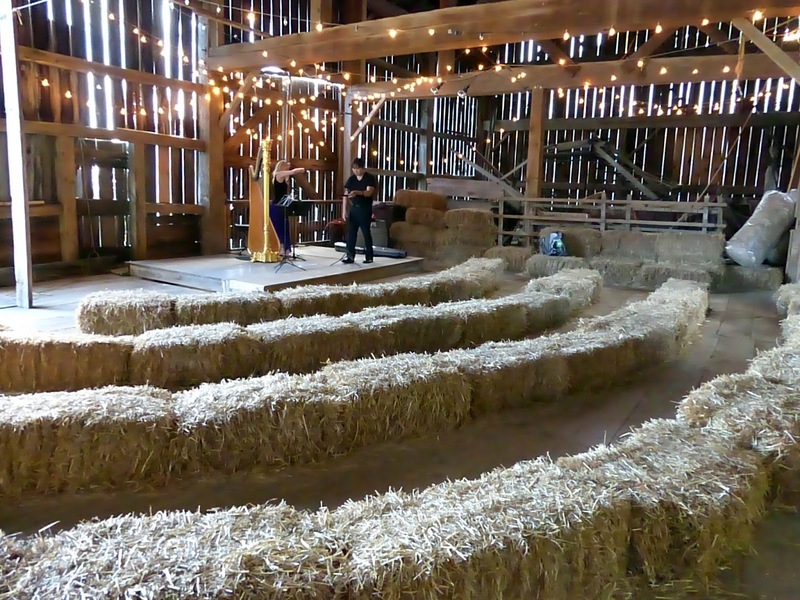 As the brochure advertising the concert said, there was "wine, food, hay bales, and light streaming through the barn boards." 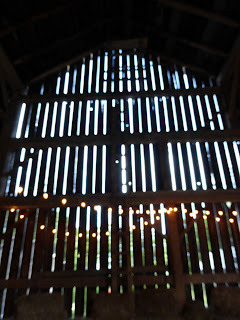 I took a shot of the exterior of the barn because I really liked the way you could see through, to the opening on the other side. Across from the barn, there was a wine store that sold wine made from the grapes growing in the fields behind. Lisa and I tasted a couple of different wines before purchasing some bottles - white for Lisa and red for me. 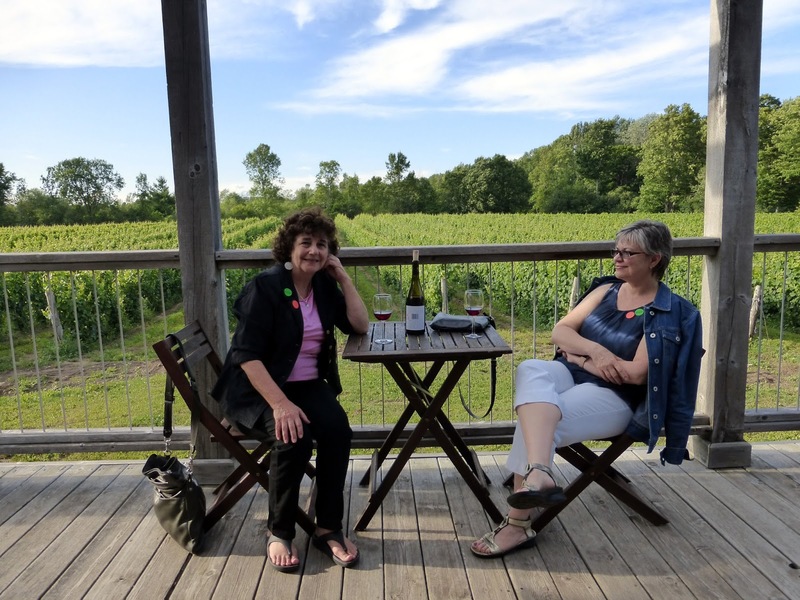 Before the concert, we sat outside overlooking the vineyard and drank some of the delicious red we had chosen. We were served a meal by an Ottawa chef named Jonathan Korecki, from Restaurant 18 in the Byward Market. These appetisers were really yummy! 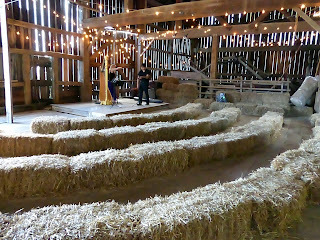 Then it was time to go into the barn for the concert. I loved this cathedral-like view of one wall, with all the light coming in through the boards. The musicians were all members of the National Arts Centre orchestra. 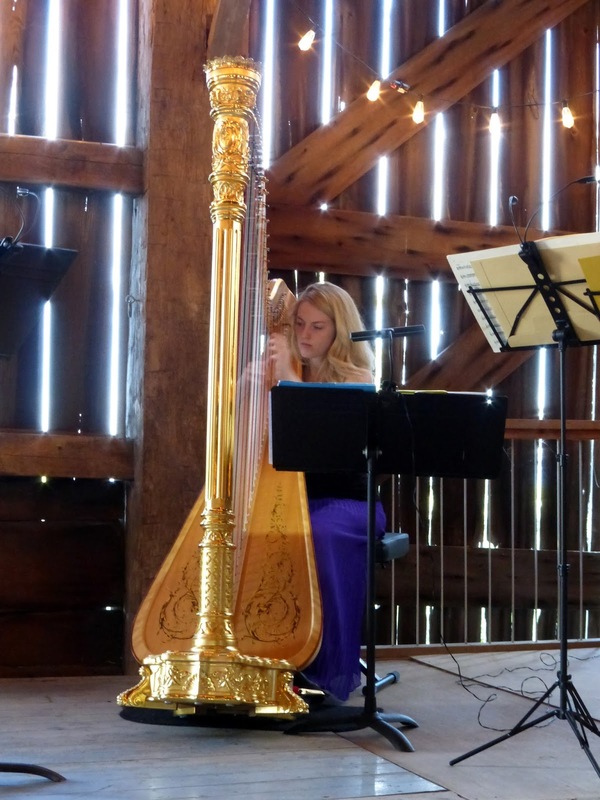 Here is Michelle Gott, the harp soloist, warming up. There were three other musicians from the NAC orchestra. 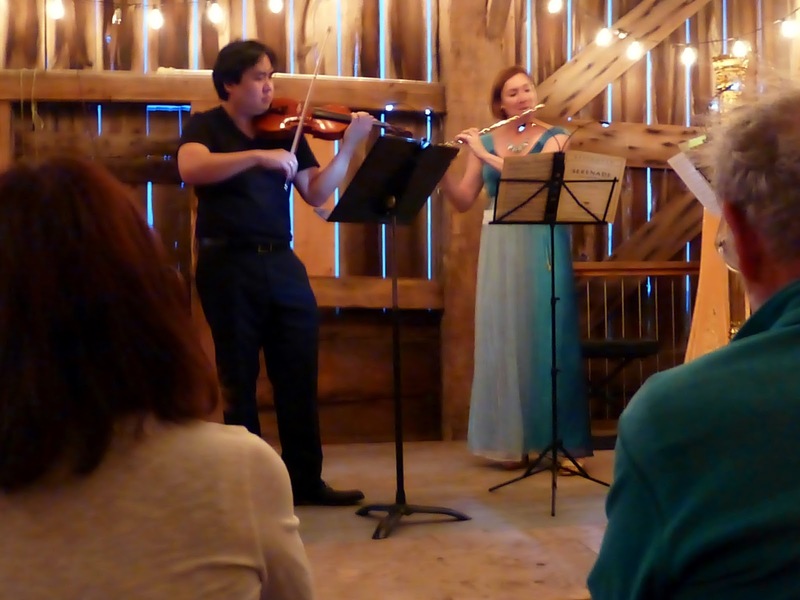 In this picture, Yosuke Kawasaki, concertmaster, and Joanna G'froerer, principle flute, are playing Beethoven's Serenade for Flute, Violin and Viola (I couldn't get Jessica Linnebach, the viola player, in the picture). It doesn't get any better than this - music, food and wine on a magical summer evening. That looks fantastic! Great pix. Looked like a great day. Looks like so much fun! 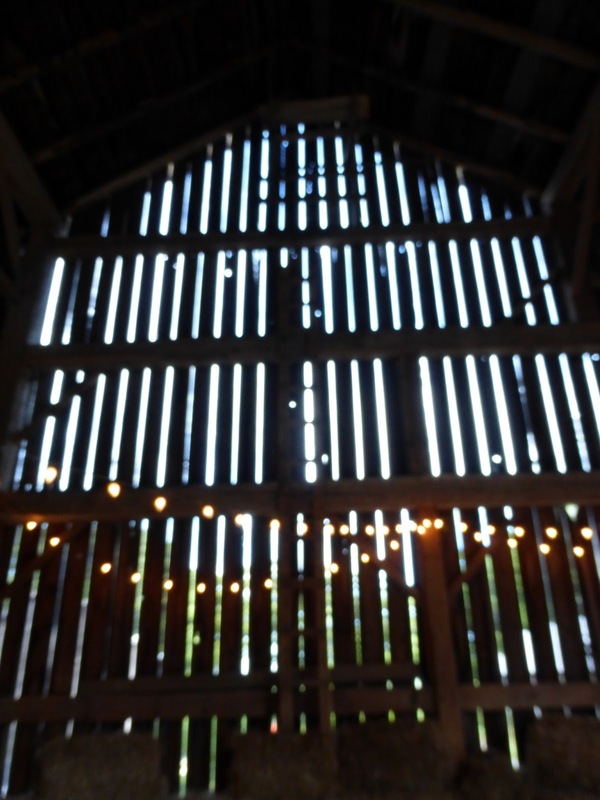 I would love to go to a concert in a barn. My name is Thor Eglington and I am part of the group that staged those concerts as part of our (hopefully) ground-breaking festival: classicalunbound.com. I came across your 2015 post looking for information relevant to our festival, and I am so pleased that you enjoyed one of our first "test concerts" where we 'hammered-out' the details. 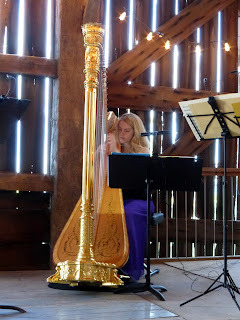 We started-off with a few concerts with food by Chefs Jonny Korecki and Jamie Kennedy in that winery hay barn amongst the bales. In 2016 we added winery tasting halls, a working-farm barn-hall, and a gourmet ramen-noodle restaurant. We are at it again in 2017, and our plans include 7 different classical music concerts across 4 very different performance contexts, with 15 top-flight orchestral musicians, a premiere-league global-touring singer, and 3 apprentices, all between Aug 14 and 27. Ensembles are planned to include piano, woodwinds, brass, strings, and voice. The repertoire extends from the traditional to select beautiful compositions from 6 active composers, who are hoped to be onsite to speak about their pieces. We would love to see you there! Full details and tickets will be released April 01 at classicalunbound.com. Thank you again "City Mouse/Country Mouse" for taking the time to let folks know how our concerts made you feel.